Love to sing? Sing — or used to sing — in a school, college, community or church chorus? Miss it or want more variety? The Valley Chorale is the place to be. We are seeking ensemble singers — those who believe the sound of many voices is more thrilling than just one. A blending voice and a good musical ear are necessary. Choral experience and music reading skills are a plus but not required. Auditions are simple and friendly. Men and women from high school to grandparents are eligible. 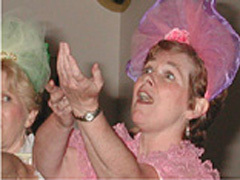 The chorale's repertoire includes classics, spirituals, and pops, as well as a costumed musical theater vignette. The program features both a cappella and accompanied music. Rehearsals are Mondays at 7:30 p.m. at the First United Methodist Church, 535 Old San Francisco Road, Sunnyvale. Please see Membership for details on how you can join us!